• "The Making of 1941"
• "The Marketing of 1941"
Hero takes a fall, part one: Steven Spielberg's career progressed on a nice track during most of the 1970s. He started out the decade with a well-respected TV movie called Duel and released his first theatrical film, Sugarland Express in 1974. While few took notice of that picture, the same cannot be said for his next movie, 1975's Jaws, which went on to break box office records and earned an Academy Award nomination for Best Picture. 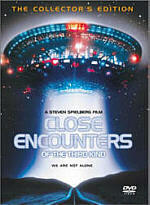 Spielberg enjoyed continued enormous success with his next feature, 1977's Close Encounters of the Third Kind, which also made scads of money and snagged Spielberg his first Academy Award nomination as Best Director. After such a great run, expectations clearly seemed high for Spielberg's final film of the decade, 1979's 1941, and unquestionably some critics were gunning for him. We love success in the US, just as long as someone doesn't experience too much; when that happens, fairly or unfairly, many folks will search for some sort of Achilles heel to bring that person back to Earth. That dose of reality slapped Spielberg squarely in the face with 1941. Critics reviled it as puerile and overblown and audiences largely avoided it. After a terrific run of both artistic and financial success, Spielberg finally had a flop on his hands. You know what? He deserved it. 1941 remains a big, stinking pile of a movie. Spielberg took his own skills, a script from the talented duo of Bob Gale and Bob Zemeckis (who together made I Wanna Hold Your Hand and Back to the Future), a huge cast of fine actors, and an overwhelming budget and wasted it on one of the most nonsensical pieces of loud, annoying tripe to come down the pipe in quite some time. Whenever a movie bombs on this many levels, inevitably a counterculture of supporters appears who urge you to believe that the film was simply misunderstood and that it's actually very good. This tendency becomes even more likely when a) some time has passed since the film's release, and b) someone with an excellent track record made the film. These apologists have definitely appeared in regard to 1941 as these revisionists try to convince the public that it's something of a "lost gem" from Spielberg's canon. Hell, Steve himself pops up at the start of the DVD's documentary and tells us how the Europeans loved it and that we Americans just didn't get it. Don't believe the hype. Later on in the documentary, Spielberg pretty much acknowledges the faults of 1941 and comes close to saying that he shouldn't have made it; he doesn't quite get there, but he seems to at least tacitly admit that the movie's something of a dog. And a dog it is - a smelly, flea-bitten one at that. While 1941 never becomes unwatchable, it fails in two significant ways: it's boring and it's unfunny. For an action-comedy, those are sins about as unforgivable as they come. Watching 1941 lets me understand how that reporter who viewed the Hindenberg's crash felt: oh, the humanity of it all! The project wastes so much talent for so little reward. 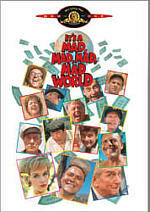 Spielberg clearly attempted to emulate the wackiness and huge all-star cast of It�s a Mad, Mad, Mad, Mad World but all he got was a crappy, crappy, crappy, crappy movie. It's not easy for me to write this. I've been a Spielberg fan for most of my life, and although I think he's gone a little preachy over the last few years, I still think he's one of the most talented filmmakers alive. How did this fiasco happen? All I can figure is that the success got to him a bit. When you do that well, you start to think you can do anything. Spielberg seemed to suffer from the "bigger is better" syndrome; he tried so hard to make 1941 a huge, overwhelming experience that he lost all sight of any direction he may once have had. For the most part, 1941 tries to gets its laughs through violence. Man, that's about all we see in this movie; smashed up this, beat up that, blown up everything. If there was any subtlety on display here, I couldn't find it. Over the top isn't necessarily a bad thing. Sometimes crude and rude works well. Unfortunately, that ain't the case here. I think I chuckled a few times during the movie. I remember that I liked the bit with the kid who ate soup through his gas mask. I also enjoyed the reveal of Herbie�s (Eddie Deezen) puppet. All the rest remains something of a blur. Actually, most of the entertainment value of 1941 stems from your memories of its performers work in much better films. We get whole chunks of casts from other ventures. 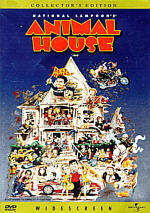 You have two from Animal House (John Belushi and Tim Matheson, plus a cameo from director John Landis that I won't count), two from Saturday Night Live (Belushi and Dan Aykroyd), two from SCTV (John Candy and Joe Flaherty), three from Jaws (Murray Hamilton, Lorraine Gary, and Susan Backlinie), three from Laverne and Shirley (Penny Marshall, David L. Lander and Michael McKean), and no fewer than four actors from I Wanna Hold Your Hand (Nancy Allen, Bobby DiCicco, and two of my long-time favorites, Wendie Jo Sperber and Eddie Deezen). Add to that fine list this roster of talent: Robert Stack, Toshiro Mifune, Treat Williams, Slim Pickens, Ned Beatty, Christopher Lee, Warren Oates, and even budding psycho Mickey Rourke. With that many quality performers, shouldn't something entertaining have happened more frequently than it did? Cripes, one look at that roster makes me wonder if Spielberg didn't intentionally tank 1941; it just doesn't seem possible that so many fine people can collaborate on something and have it turn out so badly. I certainly don't blame the actors for the movie's failings. All perform competently, though I'd be hard pressed to choose any real standouts. The actors kind of ride along with this disaster and seem afraid to try anything terribly different; I suppose that they were afraid to make themselves more noticeable because they didn't want to become targets for the inevitable attacks that 1941 would provoke. I probably enjoyed the work of Deezen and Sperber the best, but that's probably just my own personal preference at play. Hell, even they only barely registered; my memories of their interactions in I Wanna Hold Your Hand amuse me much more than did anything in this film. On the positive side, the film's effects are very well produced; you can definitely see where the money went. At times, I was actually startled by the scale of the picture, just because I couldn't stop thinking about how expensive the damned thing would be nowadays. I'd guess this sucker'd cost at least $150 million, maybe more. I'm not one of these people who attacks large budgets just on principle; if James Cameron needs $200 million to make Titanic, so be it - at least the ends justified the means. The same clearly cannot be said for this fiasco. 1941 appears in an aspect ratio of approximately 2.35:1 on this single-sided, dual-layered DVD; the image has not been enhanced for 16X9 televisions. When I originally reviewed 1941, I thought the picture looked absolutely terrible. Upon second consideration, I realized it wasn�t as horrid as I first believed, although it still presented a number of problems. Many of the issues that marred 1941 stemmed from production choices. Spielberg opted to use heavy smoke effects during a lot of the film, and this made much of it look hazy and indistinct. Sharpness remained the biggest problem I detected throughout the movie. At best, the image appeared moderately crisp and distinct, but on many occasions, it seemed rather soft and fuzzy. The lack of clarity rarely was as horrid as I recalled, but it still rendered much of the film as vaguely muddy and flat. Jagged edges only popped up on a few occasions, and moir� effects were rare, though when they occurred, they seemed heavy; check out any scene that shows the roof of the Douglas house to see what I mean. A little edge enhancement cropped up as well; this was most noticeable during shots of subtitles. Overall, the film didn�t betray too many print flaws. The most intrusive ones stemmed from light speckles and some grit, and I also detected occasional examples of streaks and spots. Occasional grain appeared as well, but much of the film�s perceived grain really happened due to the smoke effects; these created a hazy appearance much of the time. Colors varied, also partially due to the photographic techniques. At times, the hues seemed reasonably vivid and accurate, but they also came across as flat and washed out, dependent on the situation. The scenes in Hollywood consistently looked best, whereas the shots near the Douglas house offered the DVD�s ugliest elements. Black levels also appeared erratic, though they usually were acceptably dark and deep, while shadow detail was generally decent; a few low-light shots - especially those on the Japanese sub - came across as a bit heavy, but overall, those elements were watchable. I must admit I was surprised my opinion of 1941�s image went up over the last few years. Usually when I reassess a DVD, my ratings decline; I think I�m a better-trained viewer after watching well over 1000 discs. However, I was too hard on 1941. Though definitely flawed, it offered a more acceptable image than I originally believed. Nonetheless, it remained a problematic transfer. I gave it a �C-� largely based on the relatively positive images seen in the Hollywood scenes, but I still strongly considered awarding it a �D+�. That still beats the �D-� I originally gave to 1941, but make no mistake - the movie still looked fairly weak. I also altered my original rating of the Dolby Digital 5.1 soundtrack heard during 1941, but that change was much smaller. In my old review, I gave it a �B+�, whereas I knocked it down to a �B� on reappraisal. However, this was also a tough grade to award, for the audio offered a mixed bag of highs and lows, though the latter dominated this surprisingly strong soundtrack. The soundfield provided a very satisfying presentation for an older work. Music showed consistently solid stereo imaging, while effects created a clear and engaging presence. Those elements blended together cleanly, and they also offered good panning from channel to channel. The surrounds added a very fine layer of reinforcement to the affair, and they also provided a surprising amount of unique audio. Occasional stereo sound came from the rear - mainly during scenes with gunfire or planes - and the package presented a much more involving and active presence than I�d expect from an older mix. In regard to sound quality, that was where we encountered some problems. However, much of the track offered quite positive audio. John William�s score sounded simply terrific. The music showed bright highs and rich lows as it seemed warm and dynamic throughout the film. Effects suffered from bouts of distortion at times, but these remained reasonably minor. A few louder elements seemed somewhat rough, and a few other parts of the track came across as thin and tinny, but effects generally provided acceptable fidelity, and they also boasted fine bass response much of the time. Tanks rumbled across the screen, while explosions and other low-end segments showed tight and rich bass which never seemed boomy or thick. Based on those aspects of the track, 1941 could have entered �A� territory for its sound. Unfortunately, dialogue created some significant problems. At best, speech seemed wan and flat; most of the mix showed intelligible but lifeless dialogue. However, quite a lot of edginess interfered with the dialogue, as the lines often sounded rough and brittle. I never ran into any intelligibility problems, but the speech could be rather sibilant and harsh at times. Since the rest of the soundtrack provided such strong audio, I hated to have to lower my grade due to the dialogue, but unfortunately, those elements simply seemed poor. Still, the overall impression remained positive for a flick from 1979, and 1941 impressed me for the most part. 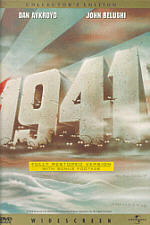 This �Collector�s Edition� release of 1941 ports over a 1996 laserdisc boxed set. I never owned that package, but it appears that the two offer identical features. Actually, the DVD outdoes the LD in one regard: it provides Dolby Digital 5.1 sound as opposed to the Dolby Surround 2.0 mix heard on the LD. One of the extras found here appears within the movie itself. The DVD touts its �fully restored version with bonus footage.� This means that the 146-minute film runs almost a half an hour longer than it did in theaters during 1979. Whether this is good or bad depends on your point of view. Steven Spielberg refuses to record commentaries, but 1941 does provide one alternate audio experience: an isolated music score. Available through the disc�s �Spoken Languages� menu, this feature provides John Williams� score in Dolby Digital 2.0 sound. Though it didn�t do much for me, I thought it was a nice addition nonetheless. Much more interesting to me was the disc�s documentary. Entitled The Making of 1941, this 102-minute and 40-second program offered a terrific history of the film. It offered a few clips from the flick as well as some outtakes and Spielberg�s home movies shot on the set. Primarily, though, it shows modern (circa 1995) interviews with Spielberg, executive producer John Milius, writers Robert Zemeckis and Bob Gale, editor Michael Kahn, composer John Williams, director of photography William A. Fraker, special effects creator AD Flowers, and miniature supervisor Greg Jein. To put it mildly, this is a fascinating and informative piece of work. It starts with the project�s origins and takes us through it development, alterations made along the way, casting, production anecdotes, effects concerns, possible endings, and both critical and popular reactions to the film. Very few stones remain unturned, and the participants offer fairly frank opinions of the work; they mainly think it�s a good flick, but they recognize some of its shortcomings. The only flaw I found with this program related from the absence of any actors; with such a huge cast, at least some of them should have appeared. Nonetheless, this was a consistently fascinating documentary that entertained me much more than did the film itself. The 1941 DVD also includes eight minutes and 35 seconds of deleted scenes not shown in the documentary. To be honest, I have no idea how they decided what to keep and what to drop; none of these deleted scenes seem any worse than what they put in the finished feature, and it's not like pacing was a major concern. Bravely, the DVD offers a number of original reviews of the film, virtually all of which were negative (some more than others). The disc includes six quick blurbs and three full articles. We also get the standard Cast and Filmmakers biographies. That domain includes short but good entries for Spielberg as well as actors Dan Aykroyd, John Belushi, Lorraine Gary, Ned Beatty, Murray Hamilton, Christopher Lee, Tim Matheson, Toshiro Mifune, Warren Oates, Treat Williams and Robert Stack. More text appears in the Production Notes section. This offers a quick recap of the film�s history. It includes little we can�t find in the documentary, but it sums up some issues reasonably well. In the Production Photographs area, we find 366 stills; in addition, some text offers captions for many of these. Wackier pictures appear in 1941 Comic Relief, a collection of 10 shots that shows production photos with nutty speech balloons attached. Still more pictures show up in The Marketing of 1941. This 80-still domain includes posters, proposed art, promotional pictures, other ads and merchandise related to the flick. Lastly, three theatrical trailers finish off the DVD. Two of these are pretty standard, but the first offers a �teaser� that focuses on Belushi. Here called Wild Wayne Kelso, the footage was shot specifically for the ad, which makes it more interesting than usual. Ultimately, I have mixed feelings about the 1941 DVD. While I clearly disliked the film and found its picture quality problematic, I really enjoyed the fine supplemental materials and at least the good 5.1 mix made the movie a little more palatable. Maybe I'm just screwy, but those extras are enough to make this package of interest despite the poor quality of the film. Fans of Spielberg may want to have it just for the historic interest inherent in those features. As such, I'm happy I have the set, even though I may never again watch the movie itself. Whether you believe that's enough to make 1941 worth owning is up to you.